The Tungsten T5 cost around $400, less than what the first iPhone debuted for. It was a sophisticated device doing almost everything you needed, with some limitations on certain file types based on DRM. The Palm Desktop Manager did synchronization with Microsoft Outlook via a USB device. There was a stylus, but you could also touch the screen to open applications. If you look at what Palm had in 2004, they had the engineering necessary to come out with something near to the technical specs of the original iPhone in 2007. But they were not confident enough to stick the phone guts into a device like the Tungsten T5. And I am not sure I would blame them. The Apple iPhone cost $599 at launch and there were crazy queues outside every Apple shop. That is what happens when you have a fanatic following of your products. That is something you cannot imagine with a Palm device, not now, not then either. There is another aspect that is kind of misleading. If I remember correctly, the most popular phone around 2007 was the Motorola RAZR. The RAZR, while not a touch phone or smartphone, sold 130 million units and is apparently still a record today. The RAZR was amazingly light (99 grams — compare to 140 grams for the iPhone 4S) and had a very sleek design. 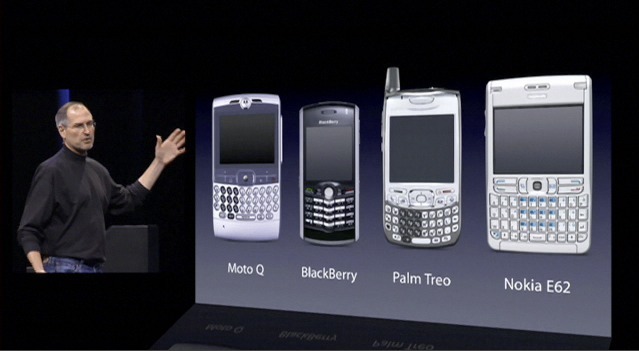 But you see, what the iPhone did in 2007 was bring all of these together. You suddenly had a device that combined the power of the PDA, the sleekness of the mainstream phone and the utility of the existing smartphone, not to mention adding the functionality of the iPod. Combine that with a fan base that was ready to snap up anything you served in the initial release and suddenly, you could recoup your costs and bring down the unit cost $200 within two months. As for the theme of Gruber’s article, I agree with his final analysis that Steve Jobs was a “large‐scale visionary”. Simply look at Palm again. Why couldn’t they do what Apple did three years later? Because Palm did not believe and became a follower instead of a trend‐setter. Compare that with Jobs who entered several markets with entrenched vendors and still bettered them, because he got Apple to come out with the right product that had the right ingredients for its fans to set the market on fire. I think the beauty of Apple products sometimes makes people forget other important decisions made by Apple. For example, while the iMac G3 did not result in Macs displacing PCs, they captured the imagination of the market enough to set the stage for newer products. The iTunes Store (with individual songs for sale) was a huge factor in the success of the iPod. Similarly, the success of iPhone apps that made quick and easy riches for many software developers is still driving the iPhone and the iPad. These were huge decisions, risky ones, that ensures that Steve Jobs is in the upper echelons of visionaries, way above the moniker of “tweaker”.